When it comes to solving externalities like pollution, efficiency standards are more popular than taxes. The rationale behind this is that the burden of taxes would fall disproportionately on the poor. This column argues that standards are in fact more regressive than taxes. Given their lower cost, the results suggest that tax solutions should be favoured over efficiency standards. Which level of government should regulate air pollution? For the nearly 100 years since Pigou (1920), economists have been endorsing taxes as the least-cost solution to externalities like pollution. But real-world examples of ‘Pigouvian’ taxes are scarce, and in the US virtually nonexistent. Instead, we tend to favour energy efficiency standards like building codes, appliance standards, and the Corporate Average Fuel Economy (CAFE) regulations for cars and trucks. An illustration of America’s preference for energy efficiency standards over carbon taxes can be found in the US’s 2015 filing to the UN Paris Climate Agreement in 2016.1 The US pledged to cut carbon emissions by 26%–28% below 2005 levels by 2025. And it promised to do so using energy efficiency standards for dozens of types of appliances and equipment, building energy efficiency codes, and tightened fuel economy standards for cars and trucks. The filing contains no hint of a carbon tax. Regulating efficiency in this way costs more than taxing energy. Austin and Dinan (2005) show that the CAFE standards cost 2.4 to 3.5 times as much as a simple tax on gasoline that would reduce carbon emissions by the same amount. Jacobsen (2013) finds that the CAFE standards cost seven times as much as a comparable gasoline tax. Why not take the less-costly Pigouvian approach? The main argument against pollution taxes seems to be that their burden would fall disproportionately on lower-income households. They are regressive. That argument comes from all quarters, from the conservative Washington Examiner (Burnett 2018) and Wall Street Journal (2009) to the liberal-leaning HuffPost (Chameides 2011) and even from mainstream environmental organisations like the Sierra Club (Harvey 2016). These concerns that pollution taxes would be regressive do have empirical support. 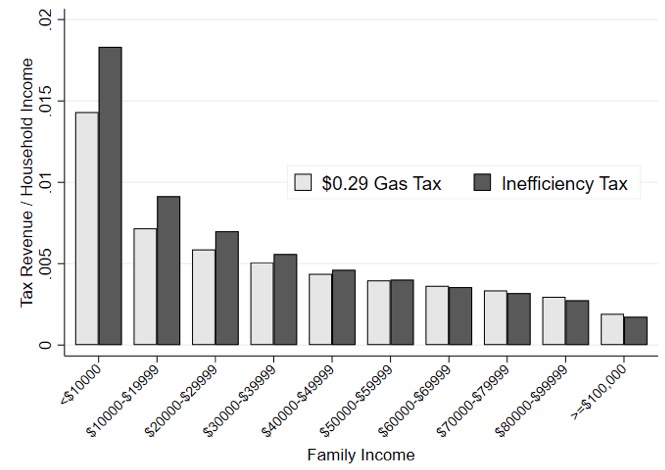 Poterba (1991) shows that spending on gasoline falls as a share of annual income. So too, presumably, would the burden of a tax on gasoline. Hassett et al. (2009) and Grainger and Kolstad (2010) both show that a carbon tax would be regressive. The Hillary Clinton presidential campaign of 2016 considered proposing a $42 per tonne carbon tax, but abandoned the idea because “poor and working class households spend a larger share of their income on electricity, natural gas, and gasoline” (Holden et al. 2016). So we don’t levy pollution taxes because they are regressive. Instead we enact efficiency standards, knowing they are more costly. But until now nobody has asked the obvious follow-up question. Are efficiency standards less regressive than pollution taxes? If so, a case could be made for the standards, even though they are more costly. But if efficiency standards are worse for low-income households, that case collapses. My new paper answers this question in its title: “Energy efficiency standards are more regressive than energy taxes” (Levinson 2018).2 Before making that case theoretically and empirically, I need to convince readers of two things. First, I need to model efficiency standards as economically equivalent to a tax on inefficient cars and appliances. That idea has been around since Kwoka (1983) who showed that the CAFE standards – new at the time – were economically equivalent to a tax on inefficient vehicles, a subsidy for efficient vehicles, or some combination of the two. To meet the fleet-wide average fuel economy standard, carmakers lower the prices of their efficient vehicles to sell more of them, and raise the prices of their less efficient vehicles to sell fewer. A subsidy for efficient cars, a tax on inefficient ones, or a combination of the two would all have the same effect at the margin. To compare the two policies directly, I compare the energy tax to an energy efficiency standard modelled as a tax on the relative inefficiency of appliances or vehicles – think of a tax assessed on air conditioners based on their kWh of electricity per BTU of cooling, or assessed on vehicles based on their gallons used per mile driven. The second thing I need to convince readers is that the progressivity or regressivity of any policy depends on what is done with the revenues. If we ignore gasoline tax revenues, a gasoline tax is regressive. But if we rebate those revenues equally to every household, low-income households would pay less in gasoline taxes than they receive in rebates and the program would be progressive. If instead the gasoline tax revenues were used to finance reductions in top marginal income tax rates, the program would be regressive. Putting those two ideas together, I compare the gasoline tax and inefficiency tax such that they raise the same amount of revenue. That way we can ignore what is done with the revenues and focus on the distributional consequences of the most important, pollution-reducing part of each policy, the tax on fuel or on the appliance or vehicle that uses the fuel. The theory is simple and intuitive. Consumers face a trade-off. More efficient appliances or cars cost more to purchase but less to operate. The more consumers intend to use their appliances or vehicles, the greater their incentive to invest in the up-front expense of energy efficiency. If the service provided by the energy – air conditioning or miles driven – is ‘normal’ then richer people demand more. So richer households will purchase more energy services, more energy, and more energy efficient appliances and vehicles. A tax on electricity or gasoline – a carbon tax – will go up with income. A tax on inefficient appliances or vehicles – an energy efficiency standard – will go down with income. A carbon tax would be less regressive than energy efficiency standards, at least in theory. To test that conclusion empirically, I use the 2009 National Household Travel Survey (NHTS),3 with data on about 100,000 households and 150,000 cars and light trucks. The poorest households in the NHTS have annual incomes below $10,000 and use an average of 247 gallons of gasoline per year. The richest households with incomes over $100,000 use 991 gallons. I first consider a gasoline tax of $0.29 per gallon. That’s equivalent to a $36 per tonne carbon tax. If the burden of the tax is passed on to consumers based on their pre-tax consumption, then the poorest households would pay $72 per year in taxes, about 1.4% of their incomes.4 The richest households would pay $287 in gasoline taxes, 0.19% of income. Those values are plotted as the first set of (lightly shaded) columns in Figure 1. As others have shown, gasoline taxes would be regressive if we ignore what is done with the revenue. Richer households pay a smaller share of their income in taxes. But what about a comparable fuel economy standard? I consider a tax on the inefficiency of vehicles, as measured by their gallons-per-mile rating,5 that would raise the same revenue as the $0.29 gasoline tax. As before, I assume the burden is passed through to vehicle buyers, based on pre-tax vehicle choices. Based on the cars they own, households with less than $10,000 would pay $92 per year in this inefficiency tax, or 1.8% of their incomes. Households with incomes over $100,000 would pay $260, or 0.17% of income. Those values are plotted as the second set of (darkly shaded) bars in Figure 1. This inefficiency tax is also regressive. Richer households pay less in taxes as a share of income. However – and this is new – the gasoline tax is less regressive than the inefficiency taxes. Both decline as a share of income, but the inefficiency tax declines faster. The fact that carbon taxes are regressive does not justify supporting energy efficiency standards in their place. A carbon tax would be less regressive than energy efficiency standards, in both theory and in practice. Austin, D and T Dinan (2005), “Clearing the air: The costs and consequences of higher CAFE standards and increased gasoline taxes”, Journal of Environmental Economics and Management 50: 562–82. Autor, D H, L F Katz and M S Kearney (2008), “Trends in US wage inequality: Revising the revisionists”, Review of Economics and Statistics 90(2): 300–323. Burnett, H S (2018), “Here's why Congress and think tanks think a carbon tax would be disastrous”, Washington Examiner, 16 May. Chameides, B (2011) “Is the conservative-friendly carbon tax a regressive flat tax in disguise?”, The Huffington Post, 25 May. Davis, L and C Knittel (2018), “Are fuel economy standards regressive?”, Journal of the Association of Environmental and Resource Economists, forthcoming. Grainger, C A and C D Kolstad (2010), “Who pays a price on carbon?”, Environmental and Resource Economics 46: 359–376. Harvey, C (2016), “It could be the nation’s first carbon tax. And environmentalists are fighting over it”, Washington Post, 17 October. Hassett, K, A Mathur and G Metcalf (2009), “The incidence of a US carbon tax: A lifetime and regional analysis", The Energy Journal 30(2): 157–179. Holden, E, H Hess and E Lehmann (2016), “The carbon tax that Clinton decided not to use: $42”, Climatewire, 21 October. Jacobsen, M R (2013), “Evaluating US fuel economy standards in a model with producer and household heterogeneity”, American Economic Journal: Economic Policy 5(2): 148–87. Kwoka, J (1983), “The limits of market-oriented regulatory techniques: The case of automotive fuel economy”, Quarterly Journal of Economics 98(4): 695–704. Levinson, A (2018), “Energy efficiency standards are more regressive than energy taxes: Theory and evidence”, Journal of the Association of Environmental and Resource Economists, forthcoming. Poterba, J (1991), “Is the gasoline tax regressive?”, Tax Policy and the Economy 5: 145–164. The Wall Street Journal (2009), “Who pays for cap and trade?”, 9 March. [2 ]Davis and Knittel (forthcoming) ask a related question, showing that fuel economy standards are also regressive, but they don’t compare taxes and standards directly. [3 ]For details see nhts.ornl.gov. I approximate incomes here as the midpoints of the ranges in the NHTS, and use 1.5 times the top-coded highest category, following Autor et al.(2008). Gallons per mile is the inverse of the common miles per gallon (mpg) measure of efficiency.